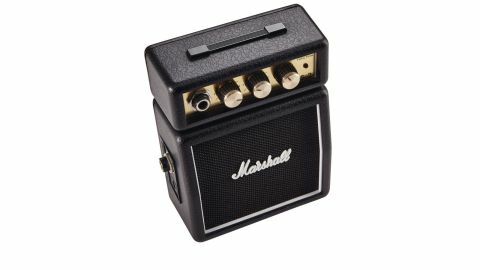 The mini Marshall with (a surprisingly) mighty volume! Decent clean tones. Excellent value for money. The Marshall MS-2 is ubiquitous for a reason, packing two channels for a modest outlay. "It sounds good: the cleans stay clean, and the tone knob's range keeps things from getting mushy"
It sounds good, too: the cleans stay clean, and the tone knob's range keeps things from getting mushy or piercing. Plus, switching to the OD channel gives you a crunch that - while boxy and lacking in bottom-end - captures the essence of that Marshall vibe with a bridge humbucker for classic-rock riffs. The only snag is that the volume knob controls gain on this channel, and considering it sounds best with the volume up high, it could end up too loud for next door - you've been warned!